Chief Olusegun Mathew Okikiola Aremu Obasanjo, GCFR, Ph.D. (/oʊˈbɑːsəndʒoʊ/; Yoruba: Olúṣẹ́gun Ọbásanjọ́ born 5 May 1937) is a Nigerian politicians and general. He was President of Nigeria from 1999 to 2007. He was a military ruler from 13 February 1976 to 1 October 1979, and a democratically elected president from 29 May 1999 to 29 May 2007. 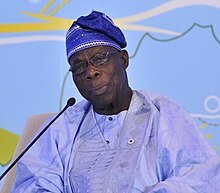 From July 2004 to January 2006, Obasanjo also was Chairperson of the African Union. ↑ Ebuzor, Chika. "'Nigeria is sitting on a keg of gun powder,' OBJ says". Pulse Nigeria. Retrieved 13 December 2015.